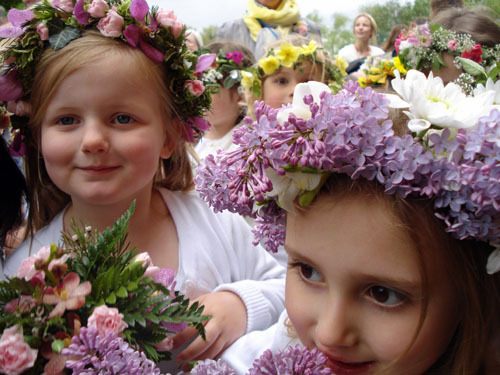 We are not aware of any other suburb where May Day celebrations survive on the scale they do in Brentham, though the tradition continues enthusiastically in a handful of towns and cities in Britain. Tutankhamun and a ban by Scotland Yard both feature in the 100-year history of Brentham May Day. The festivities begin with a procession around the streets of the garden suburb, led by a marching band. It’s a captivating sight. Hundreds of spectators jostle for space on the pavements, traffic comes to a standstill, and residents wait at their garden gates for their first glimpse of the parade. Taking part in the procession are little boys in fancy dress, the May Queen-elect, Britannia, Jack-in-the-green, and, the focus for many eyes, more than 150 young girls, all in white and adorned with fresh flowers. The curious figure of Jack-in-the-green (who looks like a walking and dancing bush and is often barefoot) adds to the festive air. The procession returns to the Club at around 3.00 pm for the crowning of the May Queen and a series of traditional dances round the maypole. For many children the highlight of the afternoon is their special tea after the dancing. See the archive for copies of May Day programmes and a gallery of former May Queens.